Citizens of Turkey will go to the polls for their first direct presidential elections on 10 August. Nearly 53 million registered voters are expected to decide between three candidates in the first round. Unless one of the candidates wins more than 50 per cent of the vote there will be a second round between the top two candidates. Since the establishment of the Turkish Republic in 1923, presidents were elected by the parliament until the 2007 referendum that introduced direct elections for the president. As this is the first plebiscite of its kind, it’s not surprising that some of the laws lack the kind of transparency that we at Transparency International Turkey would like, particularly when it comes to asset declarations and campaign finances. To that end civil society has been pushing for some changes, some of which have been successful. Transparency International Turkey’s campaign ‘May the Transparent Win’ called on the presidential candidates to declare their assets publicly before the election. The current law only requires candidates to declare their assets to the Supreme Electoral Council of Turkey, and only the winner has to make a public declaration of assets. Plus, there is no deadline for when this must happen. All three presidential candidates made a public declaration of what they personally own. This was a good first step. Now, in order to ensure full transparency we believe candidates should declare the assets of their closest relatives, too. Our campaign also called for candidates to publish campaign donations and campaign spending. Political financing has been a controversial issue in modern Turkey. The law allows for donations from Turkish citizens and is unclear about candidates spending their own money or state contributions. There is an upper limit for single donations of 9,082 Turkish Lira (US$4,204), but there is no limit to total campaign expenditures. And while the Supreme Electoral Council of Turkey has access to the records of donations, there’s no law stipulating that candidates have to publish the amount of donations. We asked the three candidates to publish how much they received and they did, but not who gave them. Selahattin Demirtaş, another candidate, also announced the amount spent for his presidency campaign. We also wanted to find out if people cared who were donating to the different candidates so we took to the streets to ask ordinary voters. Not surprisingly, the majority do. Click here and here to see the videos. 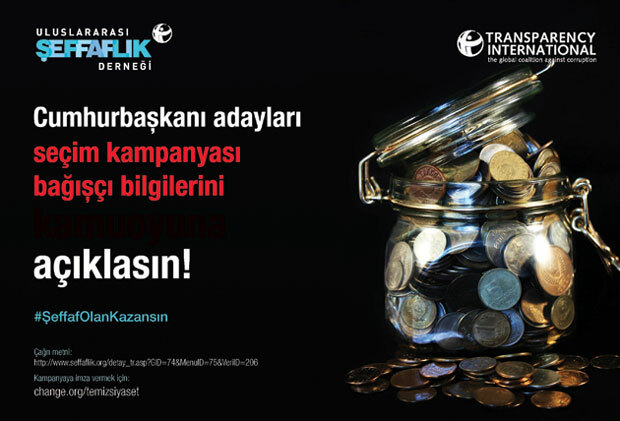 Overall, Transparency International Turkey’s call for greater transparency can be called a success, but there are still some types of campaign contributions that are not covered by the laws – for example, contributions in kind. And there’s also the issue of the advantage of the incumbent. As prime minister, Recep Tayyip Erdoğan has much greater access to the state resources for a presidential campaign than his opponents. This is clear when you look at the television time for candidates, particularly on the most-watched state media. For example, in one recent three-day period, the Institution of Turkey Radio and Television (TRT) allocated 533 minutes to Erdoğan, 3 minutes to İhsanoğlu and 45 seconds to Demirtaş. This hardly indicates impartiality and accountability, particularly when the campaign itself only runs for 29 days, far shorter than in most other countries. Turkish citizens will go to the polls on 10 August for the first time to elect a president. It is an historic vote and – we hope – an opportunity to establish transparency in Turkish politics, which as we have seen is what Turkish citizens are demanding. Editor’s note: The 12th paragraph of this blog post was amended on 11 August to remove an over-specific description of a candidate.